Over the years, I’ve had a couple people challenge me on using the term “thought leader” in my blog posts, books, and speaking. Some people just really dislike the term; others have told me that real thought leaders wouldn’t call themselves that, and that I might attract the wrong type of clients if I used that terminology in my writing. I see where this opinion comes from, but I want to take a somewhat controversial stance in favor of the term “thought leader.” In this episode, I break down the term and talk about why I think it’s the best possible description of what so many of us want to do in our work: Make the biggest difference possible and change lives for the better. At the core of thought leadership is dedicated service. Service to your message, of course, but most importantly to your audience. Stepping into your role as a leader and truly committing to it puts you in the best position possible to serve the people you’re called to serve. I’m also going to be running a giveaway for my listeners! 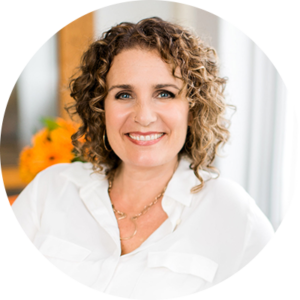 I’m offering some of my favorite books – Resonate by Nancy Duarte, Presentation Zen by Garr Reynolds, and Brain Rules by John Medina – as well as some of my favorite candle and notebook sets. All you have to do to enter is head over to the Speak So It Matters page on iTunes, leave a review, and send a screenshot of your review to me at michelle@michellebarryfranco.com. Why it’s so important to embrace the idea of being a leader. What it means to know who you serve and how to serve them deeply. Why you should step into your commitment to leadership if you want to serve your audience to the best of your ability. How even a seemingly small story, sentence, or action can make a big difference in a listener’s life. You are listening to the Speak So It Matters Podcast episode number 40. 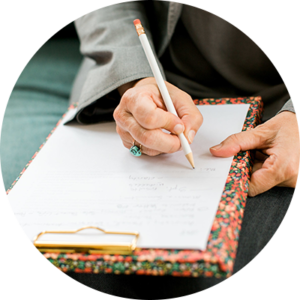 Welcome to Speak So It Matters where we are a mix of stories of inspiration and super practical public speaking and communication guidance to help you release all the barriers to becoming the speaker you know you’re meant to be. Some of us are called to use our voice to serve others and our world as well as to become the most fully expressed version of ourselves. If that’s you, you’ve landed in the right place. Let’s do this, my friend. Hello, hello, my speaker friends. It is February. I’ve got my cup of dark roast nearby. I’m heading to New Orleans today. And I’m just feeling really lovely. Best of all, my favorite, I get to be here with you for a bit. So today we’re going to talk about something controversial, yet it’s also something at the very heart of what I believe about making the biggest difference in your speaking. I say it’s controversial because I’ve had at least two of my marketing and copywriting experts and a reporter from a super big name newspaper bring up its seemingly shady characteristics with me totally unsolicited. And honestly, I’ve heard countless other random comments about this particular innocent term or phase. So I’ll tell you all about that drama in a minute. But first I got this awesome idea. I would love to hear from more of you. So I decided to do a drawing with prizes. So there’ll be these fun prizes such as my favorite great speaking books, aside from my own Beyond Applause speaking book because you can get that for free right now. And you’ll hear all about that toward the end of the podcast. But these are books like Resonate by Nancy Duarte, Presentation Zen by Garr Reynolds, Brain Rules by John Medina. And because peaceful zen, beautiful surroundings lead to amazing creativity, my favorite candle and sweet notebook journal set, for example, you are going to love this. So I have a few more ideas too. But I think that makes up five, right? I’m going to draw five names and here’s how you play. Head on over to iTunes, find the Speak So It Matters Podcast, click on ratings and reviews, click that five-star icon, assuming you love this show which I hope you do and click the write a review button. Share what you love about this podcast so others can see what they have to look forward to when they listen in. Take a screenshot, email it to me at Michelle at michellebarryfranco.com. Don’t worry, we’ll put all these instructions in the show notes and my email address. And your name will go in the drawing. Fun, right? I cannot wait. This is going to be so fun. Okay. So now for our controversial topic for today. We’re going to talk about what it means to be a thought leader and in particular why I think you should fully own your role and commitment as a thought leader in your industry. So if you’re like my marketing experts and this super fancy reporter, you might be resisting this conversation right now. You might even fully dislike this term altogether. These poor sweet little words, they really gathered up a strong resistance. A couple years ago I was collaboratively crafting some copy with a copywriting expert friend of mine, someone I really trust and admire. I send over my draft of the sales copy. It had the word thought leader throughout, and she sent it back with a few notes here and there and a longer paragraph about how much she really disliked this term thought leader. When I asked her why she felt so strongly about the word, the term, she said, “People who are actually thought leaders wouldn’t call themselves that. I think you’ll attract the wrong kind of people.” I totally got what she was saying. That’s the thing. And I got a little fired up too, to clear things up around this term thought leadership in the world of speaking and thought leadership overall. Because I think we’re missing out on a really powerful way to serve with our message and our work in the world if we shun this term thought leader. So let’s take a clean and innocent look at these two works. First of all the word thought. What does thought mean? Right? It’s bringing our ideas, brainpower, using our brilliant mind to explore and create. What does it mean to be a leader? Serve, right? To serve a group of people, to help them move in a direction, to lead them, to make a difference, right, on behalf of a shared goal. What a beautiful devotion to our work in the world this thought leadership commitment. What kind of service will we bring to those we’re meant to serve if we embrace these words? This commitment to bring our best ideas to light for others. Is there a better term for this? I haven’t found one. And believe me, I have searched because I do know there’s a resistance out there. I get it. Calling myself a thought leader feels weird. Hell, calling myself a thought leader is weird. Does the CEO call herself the leader of the company? No. Other people call her that. Does she know she’s the leader of the company? Of course, she does. If someone refers to her as a leader, does she embrace that? Of course, she does full-heartedly. Does knowing this, that she’s a leader, influence the way she thinks about her role and responsibilities? Of course, it does. This is why I’m passionate about the idea of embracing your role as a thought leader so that you too will bring that same leadership commitment to serve. Are you in with me on this? Yes? Okay, good. So now what? 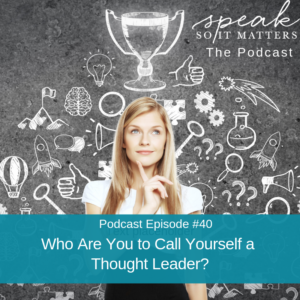 Now that you’re fully embracing your role as a thought leader, but not calling yourself one, what changes in the way you approach speaking and prepping your speaking and preparing your next talks and really your work overall? When you embrace this idea of leadership and bringing your best ideas through your leadership, you make sure that you know who you serve deeply. You take a stand for serving them in the best way possible. And you serve them regularly with commitment. So I just want to talk about these aspects, this deepening in a fuller way. So what does it mean to know who you serve and to know them deeply? When I was in college carrying around a banana and a binder full of the many textures and flavors of condoms to help my fellow protect themselves from the HIV virus, I needed to understand their lives better, which was pretty easy because I too was in college at the time. And I knew what was going on in relation to the issue of HIV and AIDS. College is a time of lots of sexual exploration for many. And I knew that was what was going on for so many of my classmates because it was going on in my life too. I knew that the information that we were sharing needed to be simple and that we needed to recognize the power of sexual exploration, the joy of it, the pleasure of it. I definitely knew that we needed to embrace the way they thought about, we thought about. I was one of them, right? So it made it easier to know them more deeply. But I needed to look at that really objectively and make sure that when I went into those classrooms and was talking about the sexual exploration experience. I did it without any embarrassment, without any minimizing of the power of that sexual exploration. At the same time, really taking an honest look at how they could be safe and still enjoy this really fun period of time in their lives, right? So now I run these girls’ circles, these storytelling circles. I lead them I should say. I get to facilitate them. And in these girls’ storytelling circles, these are sixth and seventh-grade girls that I’m sitting with. The audience is quite different because they’re in this middle school phase. They’re sort of shy about sharing their stories. Not all of them but many of them are. The girls that are in the groups that I run are highly creative, but they also I can tell have some concern about standing out too much, about doing it wrong. So my job is to understand what they’re coming in with, what they’re thinking about, what they’re afraid of so that as I bring them into this experience, I can help lead them through a really valuable process of learning to share their stories with excitement and fun and ease and confidence. My client Monique who’s a nutrition expert, she serves expats in the Philippines who are feeling lethargic and crappy in all kinds of different ways. But they aren’t sure why. So there’s all kinds of other things she understands about their lives because she’s an expat. She understands their life experientially, but she also needs to step back and really look at what are all of the issues surrounding the life of an expat. You don’t have your friends around. You don’t have your friends and family that you’re used to. The culture’s different. Where you get resources is different. The kinds of food and water that are available to you can be quite different. So just really understanding that as a thought leader, we really need to get deeply connected with who our audience is and how we can serve them in the way that is most valuable to them. Okay. So now we’ve done this deep dive really understanding our audience. Then of course because we know that we’re in this leadership role, we take a stand for serving them in the best way possible. Your point of view is what makes you a leader. Your ideas, your experience, your critical thinking, your intuitive sharing from your own story bank of struggles and triumphs. This is where you make a big difference for them. You bring them a new way to see things, new information that can actually change their lives. And I know this sounds overly dramatic, but think about it. One little new way of seeing things really can change a person’s life. I remember maybe 10, 12 years ago the first time I heard Wayne Dyer share this concept of the power of intention. And we all have this cable. He described it as a cable connected to this intention, was the way he described it. And this intention was kind of like our connection to the divine, our connection to something greater than ourselves that can power so much knowing in the world and making our difference in the world. I could just really … I saw that cable connecting to this greater power. And he talked about our only job being to keep that cable clear. So we didn’t have to know everything. We just had to keep the channel open so that we could receive information and knowing and learning from this divine energy. It’s impossible to describe all of the ways that this one insight, this one description of something that really resonated for me, changed the whole trajectory of my life. So thinking about the stand that you take for these people that you serve, who you know deeply because you’ve taken the time and energy to understand them. Taking that stand for them is your leadership. Bringing those images, those metaphors, those ways of thinking about their struggle and what’s possible on the other side of it is life changing. And when you think about how to express that in a way that will resonate most powerfully for that particular audience, you really do make the kind of difference that can change the whole trajectory of their life like Wayne Dyer did for me all those many years ago. And then from this place of deep knowing and taking a stand for them, you go out there and you serve them. You stick with it. You persevere, right? So this is you being out in the world and serving as a leader. And when we know that our role is a leader, we keep at it even when it’s not perfect, even when something goes awry, even when people don’t like what we’re saying. Have you ever been voted to lead a project like by friends or family or at work? You know that moment when someone says, “I’d like to nominate Jane to lead this”? And then everyone kind of laughs. They’re like, “She’s awesome. She’s great at making things happen.” And people are like pushing each other and laughing because you just got nominated. And everyone else is just happy to have dodged the responsibility. Well, what happens next in this scenario? I mean assuming you don’t just totally bow out and say, “I’m not doing it.” You lead, right? But you lead because you step into that role. And stepping into that role really is taking on this label. So you get people’s numbers and you have everybody exchange phone numbers and you assign the next task. You lead the charge for scheduling the next meeting. It’s like you can’t help it. You’re the leader. It’s your job. This is what thought leaders do too. They’re devoted to serving. They ask themselves what needs to be done next. They show up and make sure it happens even if others totally flake on the whole thing. So for you, you craft that life-changing talk. You keep at it. You do the deep work of crafting the kind of talk that’s transformative, that changes lives. You don’t just mail it in anymore. You can’t because it’s your role to lead. You contact that association, the corporation, the university, the organization that’ll allow you to serve the people you know you’re meant to serve. And you do this because as a leader you know that it’s your job to be out there changing lives, to be out there sharing this message that you have crafted uniquely and specifically for these people who you know you can serve. You do this because you’re a leader and this is what leaders do. Good leaders don’t walk around calling themselves leaders. No. But they do know that they’re job is to lead, that this makes them a leader. And they act into this role and title. So there you have it, thought leader. Embrace your rightful title. Step into that commitment and devotion to serve. Just don’t walk around calling yourself a thought leader, of course. You don’t need me to tell you that because you’re the kind of leader who wouldn’t call themselves a thought leader out loud. That’s why you’re here. You’re the real kind of thought leader. So I say we take back the title, thought leader, that we not shun this word and that we actually embrace the heart and the energy and commitment that is inherent in these two words combining together. And while we’re not going to walk around calling ourselves thought leaders, let’s hold this in our hearts so that we can serve in the way that I know that you know you’re meant to serve. All right. Remember how I said earlier that you can get my whole book, Beyond Applause , for free right now? Well, here’s where you get it. It’s at michellebarryfranco.com/freebook. Inside not only will you get the whole book, but you’ll get access to a resource page, an online digital resource page with all kind of additional goodies including the only presentation outline you’ll ever need. Which people tell me that they use over, and over, and over, and over, and over again. And many, many other good resources like an audience analysis worksheet which actually helps you deeply understand how you serve just like we’ve talked about in today’s episode. So there it is my thought leader friend, another delightful experience connecting with you. I just love it because here’s the thing. That call you feel to serve with your message and your expertise, that is your sign. You were made for this. You know how I know? Because you know. See you here next week. Thanks for listening to this episode of Speak So It Matters Podcast. If what you heard here today was useful, you’ll love the free guide I’ve created for you at speaksoitmatter.com/yes. Not only will you get immediate access to our Power and Grace Speakers Toolkit, including the only presentation outline you’ll ever need, but you’ll also receive weekly updates with our best resources as they’re created. I can’t wait to see you out there shining your beautiful light and changing lives with your message.